Katsushika Hokusai, a Japanese printmaker famous for his One Hundred Views of Mt. Fuji, spent a hunk of his career depicting this beloved mountain from various vantage points, caught in thrashing tsunamis and demure rainy days alike. "The Great Wave Off Kanagawa" is his most famous one, according to the Metropolitan Museum of Art. The adoration of Mount Fuji in Japanese art dates back to the 11th century. Today, the often-snow capped mountain holds World Heritage UNESCO status. Ten centuries later, Ashley Anderson, mixed-media artist and video game connoisseur, adds a contemporary voice to that adoration with his new exhibition, The 101 Views of Mt. 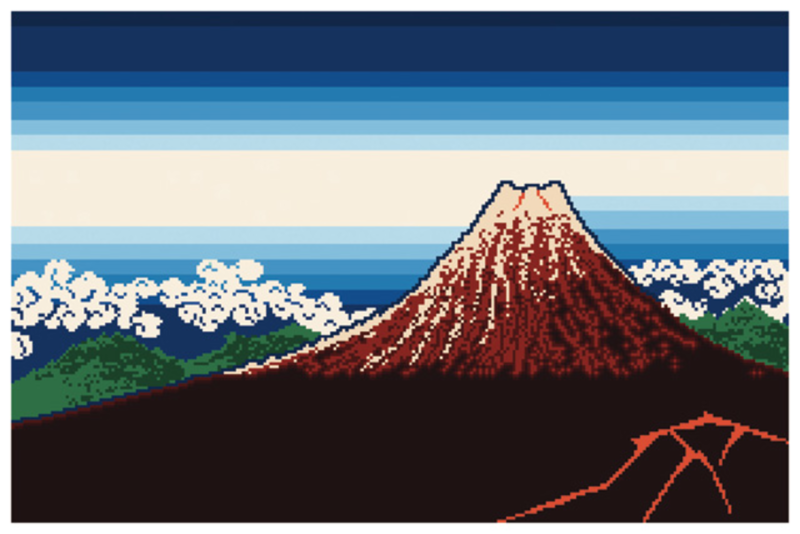 Fuji: An Art-Historical Excavation of Early Gaming. "I'm all about finding these correspondences between video game images usually not intended to exist very long in cultural memory," Anderson says about what attracts him to video game details. "The creation of those images is very telling of what cultural influences are at play." After five years of hoarding video game images of Mount Fuji, he's finally ready to show them to Atlanta — all 101 of them. It's been three years since I, personally, went to Japan. Upon our descent into the airport, the pilot said he hoped we got to see Mount Fuji during our stay. I didn't. The mountain hid behind the clouds like a timid child. Now, thanks to Anderson, I'll get 101 chances to catch a glimpse. Mixed-bag luck in 2012 granted Anderson a broken foot, and, with it, a hell of a lot of time to organize his seven-year-old video game image collection. As he organized, he quickly found an accidental collection of Mount Fuji images, thus inspiring the conception of 101 Views. Paying special attention to the often-ignored background and title screens of video games, Anderson began to capture more Mount Fuji images over the last few years. He blends his vibrant style with nods to popular culture in the same way he treated his Shinobi Marilyn series (2012), which enjoyed some time at the High Museum of Art. His research involved hours of playing games on his Playstation 2 emulator and navigating levels looking for hidden Mount Fujis. Think Street Fighter, SEGA games, arcade games, and others. Anderson says in video games, especially racing and fighting games, you must establish a sense of place. Epochal structures and geographical features — like Mount Fuji — are a shorthand method of doing that. Like Hokusai, Anderson followed certain themes for different images, with one image even being pee-themed. That particular Mount Fuji interpretation happened by accident as Anderson was playing with colors for the sea and background. After he painted the sea yellow, it quickly devolved (or evolved, pending your POV) into fourth-grade humor. "The person stopping on this route is making 'pit stops' and at one point, they peed into the ocean and turned it yellow," Anderson says. "Combined with the toilet paper structure of the scroll, I decided to make the background bathroom tile." Potty jokes aside, Hokusai inspired Anderson to temporarily turn into an archivist, hence the Art-Historical Excavation in the exhibition name, and he pushed past the character action to shine pixelated light on what often gets missed: the background.